People sing about money. (Think the Beatles, Cindi Lauper, ABBA, Lady Gaga.) They talk about money. They dream about money. But not many ordinary, everyday people do much about money. And they should. Even people who aren’t business majors. 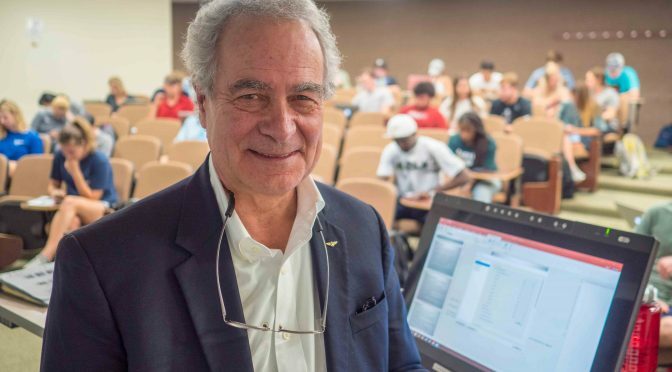 The Sam M. Walton College of Business at the University of Arkansas offers two courses – Finance 1003 and Finance 3003 – especially for those who should be doing something about their money and aren’t. Chris Tompkins, a lecturer in the Walton College Department of Finance who teaches some of the sections, says the lessons learned in the classes give students power over their money. “They will control their money instead of letting the lack of it control them,” Tompkins said. Students hear lectures on the theory of building wealth, the good and bad of credit and on buying a car or a home. They also work through financial simulations and case studies. Tompkins holds a law degree and was vice president and a national sales manager at Budgetext Corp. before beginning to teach at the Walton College. That background makes him perfectly equipped to guide students through keeping and building up the money they earn. “These courses are designed to help anyone desiring to better manage personal finances,” Tompkins said. Noel Morris, who also teaches the courses, owned and operated a multi-line insurance agency in Springdale and continues to do consulting work. “A big challenge is getting the students to realize that financial difficulties are a paycheck or two away, in the real world,” Morris said. Many of the lessons boil down to budgeting. Course instructors bring real-world examples to the classroom to help make the lessons relevant to students. The biggest challenge is getting students to understand that finance is personal – that it is not just about “business.” Students who take the courses come from all over the university – J. William Fulbright College of Arts and Sciences, Fay Jones School of Architecture, Dale Bumpers College of Agriculture, the College of Engineering and the College of Education and Health Professions were all represented in spring and fall 2017. Forty percent of the students in fall and spring sessions came from outside the Walton College. Most of those taking the courses – nearly 70 percent – were juniors and seniors. In all, more than 6,200 students from all colleges have taken the courses in the past five years.